New hours for our office manager. Congressional inaction means tax planning uncertainty. Some local lodging for employees is allowed as a business deduction. Research credit denied for unreasonable compensation. Patent transfers didn't qualify for long-term capital gain. Restaurants can include kitchen labor costs in cost of goods sold. Businesses should consult with their tax advisors about health care reform. IRS issues accounting change procedures for repairs and capitalization. Some U.S. residents from Canada get tax relief. New California efile requirement for business tax returns. Is margin interest fully deductible on Schedule A? Visit our new article: The Ultimate Sales Machine. 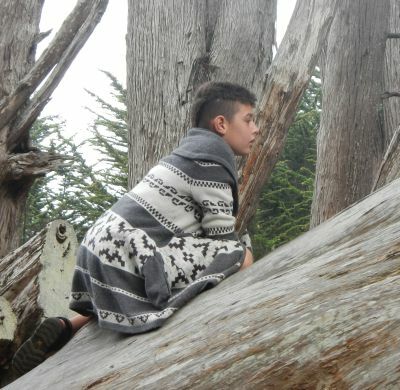 Kyan Baker climbs a tree in Half Moon Bay. Halloween is the second favorite holiday for most Americans. Be careful of those kamikaze trick or treaters! Halloween marks the coming of the holiday season. Christmas displays are already popping up in department stores. The year will soon be over! Are you ready? Maybe now would be a good time to make a year-end tax planning appointment. Michael Gray will have limited availability for the rest of the year, so reserve your time now! Call Dawn Siemer at 408-918-3162 to make an appointment! My wife, Janet Gray, just celebrated her birthday. We had a lovely family outing at Half Moon Bay. Janet has certainly been a blessing in my life and is a terrific mother and grandmother. Happy birthday! Dawn Siemer now works from 9 a.m. to 5:30 p.m. Monday, and 9am to 2pm Wednesday through Friday. As always, you're welcome to leave her voicemail at (408) 918-3162 any time. Congress hasn't taken action on some of the stimulus and relief measures that expired after 2013. For example, 50% bonus depreciation for new business equipment expired. The increased limit of $500,000 for expensing business equipment also has expired, so the limitation will be $25,000 unless Congress takes action. The exclusion from income of up to $1,000,000 of cancellation of indebtedness income for qualified residential mortgages expired. These and other expired measures that may be extended make year-end planning difficult and uncertain. Commissioner of the Internal Revenue Service John Koskinen has warned that forms won't be issued in time for the 2015 tax season if Congress doesn't take immediate action, but that doesn't seem likely since this is an election year. The IRS has issued final regulations that allow a business expense deduction for some local lodging for employees. Most local lodging is considered to be personal, not business-related and not deductible. For example, a weekend at a luxury hotel provided by the employer, lodging to avoid a long-distance commute, lodging because the employee must work overtime, and lodging for an employee's indefinite personal use are all nondeductible personal expenses. If an employer pays these, they should be included in the employee's wages. The lodging is not lavish under the circumstances and does not provide significant personal pleasure, recreation or benefit. The Tax Court upheld the IRS in disallowing part of the research credit based on compensation to a CEO that was unreasonable. The court noted the taxpayer's wages were 5-6 times the company's income, indicating a lack of reasonableness. After comparison to the wages of other CEOs, the court found reasonable compensation would be $2.3 million to $2.6 million per year, not $8 to $11 million that was paid. The CEO owned 90% of the company, which was an S corporation. His wages were about two thirds of the total wage qualified research expenses claimed by the company, and most of the credit was based on wages. This case will result in more uncertainty when computing the research credit, because most companies compute the credit based on W-2 wages. The court also found that 11 of 12 sample projects involved qualified research, or about 92%. The IRS had claimed the projects didn't qualify because of the result of the research wasn't uncertain, but the court found there was uncertainty. The Tax Court ruled against a taxpayer who claimed that royalty income from patents were long-term capital gains. The taxpayer failed to show that he had transferred all substantial rights to a corporation. The taxpayer owned 24% of the corporation, and other shareholders included the taxpayer's wife, his sister-in-law and a long-term friend. The Tax Court found the taxpayer exercised control over the corporations activities. Since the taxpayer controlled the corporation, he retained rights over the patents. The IRS Chief Counsel advised that restaurants should be able to account for kitchen labor costs as part of cost of goods sold using a reasonable method, rather than having those costs allocated using the simplified production method under the uniform capitalization rules. Since the ending inventory of most restaurants consists of ingredients not yet used to produce food for customers, the kitchen labor costs won't have to be added to the cost of those raw materials and most of them will be currently deductible. Many businesses will be subject to reporting requirements or will be eligible for tax credits on their 2014 income tax returns under "Obamacare." This should be discussed in a year-end planning meeting. To implement accounting changes under the new repair and capitalization regulations issued by the IRS, taxpayers will file accounting method change forms with their tax returns and a separate copy mailed to the IRS. The IRS will automatically consent to most of these changes. The IRS has issued revenue procedures to explain how this will all work. Almost all taxpayers with rental properties and businesses will need professional help with preparing their 2014 income tax returns. Tax return preparers should study these procedures to prepare for the 2015 tax season. U.S. residents who are participants in certain Canadian retirement plans are supposed to disregard the plan and report the income as it accrues inside the plan. Under a tax treaty, an election has been available to report the income when it is paid, like for a U.S. qualified retirement plan. The election was made on Form 8891. These accounts were also supposed to be reported as foreign accounts on IRS Forms 3920 and 8938. Most U.S. residents from Canada who were participants in these accounts probably weren't aware of these rules and haven't complied with them. The IRS just issued a Revenue Procedure liberalizing these rules. As long as a taxpayer is an "eligible individual," the income for the accounts can simply be reported consistently with how they would be reported for benefits from a U.S. qualified plan. This reporting will enable the taxpayer to claim a foreign tax credit for Canadian tax that applies to the same income that is reported on a U.S. income tax return. The accounts are also exempt from "foreign account" reporting on Form 3920. Has not reported any and all distributions received from the plan as if the individual had made an election under Article XVIII(7) of the Convention (treaty) for all years during which the individual was a U.S. citizen or resident. An individual who is not an "eligible individual" must continue to report under the current rules or apply for the consent of the Commissioner of Internal Revenue for a change of accounting method in accordance with the treaty. Form 8891 is obsolete after 2014 and will be discontinued. Beginning January 1, 2015, for taxable years beginning on or after January 1, 2014, any business entity that files an original or amended income tax return using tax return preparation software is required to e-file its California income tax return with the Franchise Tax Board. A waiver can be requested for technology constraints, undue financial burden or reasonable cause. This requirement probably relates to business forms like Forms 100 for corporations, 100S for S corporations, 565 for partnerships, 568 for limited liability companies and 541 for trusts. Most California individual income tax returns that are prepared by paid preparers are already required to be efiled. The Franchise Tax Board plans to post details to its web site shortly. We have already been meeting with folks who want a second look at their 2013 income tax returns for possible corrections. Call Dawn Siemer at 408-918-3162 on Mondays anytime, or Wednesdays, Thursdays, or Fridays before 2pm to make an appointment. Financial Insider Weekly broadcast schedule for October and November. October 17, 2014, repeat of "The women's long-term care project"
October 24, 2014, Michael Jones, CPA, Thompson Jones LLP, "Community property issues for retirement accounts"
October 31, 2014, Michael Jones, CPA, Thompson Jones LLP, "Handling retirement accounts after a death"
November 7 and 14, 2014, Cynthia Sue Larson, MBA, Life Coach, "How to manage emotions for financial decisions"
November 21, 2014, Mari Ellen Loijens, Silicon Valley Community Foundation, "Why and how to promote charitable giving in your family"
November 28, 2014, Tom Oviatt, Wymac Capital, Inc., "Reverse mortgage developments"
If I have only traditional "qualified" dividends in the same year that I have margin interest relating to purchasing securities that generate taxable income, is the margin interest fully deductible on Schedule A? Do I only pay income taxes at long-term capital gains rates for the qualified dividends minus the investment interest expense? No. The margin interest in your scenario would be subject to the deduction limitations for investment interest expenses. The deduction is limited to the amount of investment income. Qualified dividends and long-term capital gains don't qualify as investment income for this limitation. An election can be made at line 4g of Form 4952 to tax all or part of these items at regular income tax rates and include them as investment income for the investment interest expense deduction limitation.